Warren Smith, President of Sacramento Republic Football Club, established the club in 2013 to bring the “world’s sport” of soccer to the Sacramento region. The Sacramento Republic FC is laying the foundation to make its case to land a Major League Soccer franchise by introducing the USL Pro League to Sacramento. It should come as no surprise that the world’s sport has finally been embraced (some may say possessed) by America’s most diverse city. 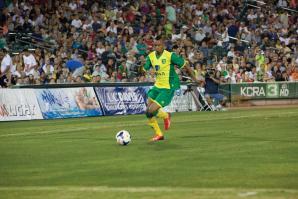 More than 14,000 people — a sellout crowd — attended Sacramento’s inaugural soccer match between the English Premiere League’s Norwich City F.C. and Mexico’s Dorados De Sinaloa. The match provided a glimpse of what is to come when the branding for Sacramento’s very own professional outdoor soccer club, Sacramento Republic FC, is unveiled.